Are you in love with the Tux? Under a lot of stress? 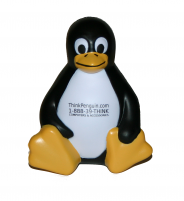 Get our penguin stress toy! This pleasant bird is more than happy to watch you while you work and won't mind when you give him a little squeeze. Most customers can get this item in as little as 1-5 business days with our "Standard Shipping" option or within the US via USPS. Must be ordered alongside another accessory or part to receive this item in just 1-5 business days via "Standard Shipping"
And within 6-10 for most other major population centers. Regardless of shipping options selected larger orders will always ship from our US warehouse (and generally may take longer to arrive).